Wireless charging seems the next big feature in the line of smartphone features to die for and like many other brands, Apple is too jumping on to the bandwagon, as is evident from a new patent it applied for. Geez! We can hardly wait for wireless charging to become a reality across devices and Apple – the master of innovation has set the process in motion by patenting its own way of doing so. How wireless charging will work in iPhones and iPads is this. 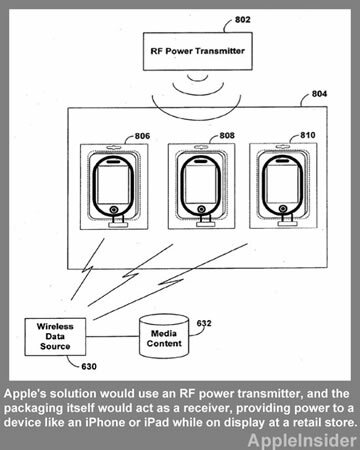 Your Apple device will be endowed with an RF receiver that can receive charging from a base RF station wirelessly. Basically, the iPhone/iPad’s packaging will contain the whole system needed for wireless charging. This packaging called ‘unobtrusive packaging’ will help you receive charge like your receive Wi-Fi signals. This kind of charging will first come on only to store shelves and then we expect to become more commonplace. As is evident from the filing, Apple still has a long way to go. We wish it luck and hope it comes out soon.Thanks to Apple Insider for the info.